"This appetizer has an unusual combination of ingredients, but they are easy to make and delicious. I am always asked for the recipe whenever I serve them. May be frozen and reheated." Preheat oven to 400 degrees F (200 degrees C). Spray mini-muffin tins with nonstick cooking spray. In a medium bowl, stir together crabmeat, green onion, mayonnaise, curry powder, salt, lemon juice, and Swiss cheese. 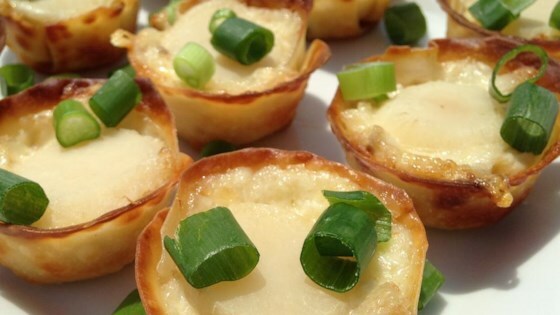 Use kitchen scissors to trim off corners of individual wonton skins; place trimmed skins in wells of mini-muffin tins. Spoon about 1 tablespoon crabmeat mixture into each wonton cup. Top each with a slice of water chestnut. Bake in preheated oven about 12 minutes, or until puffed and browned. Serve hot. Wontons are stuffed with cream cheese and crabmeat and baked crisp. I tried this recipe for baking the wontons in lieu of deep frying them, and they turned out wonderful! I will no longer deep fry wontons since baking them makes them so good and non-greasy. I halved the recipe and used a regular muffin tin not mini and they turned out fine. Very unique taste and quite good. This recipe was a great success at our Thanksgiving dinner party yesterday. Everyone enjoyed them so much that I had to forward this recipe to 9 guests. This recipe is a keeper. Thanks!